With the holiday season upon us, you may find yourself consuming just a tad more alcohol than usual. You know, because in-laws and what not. 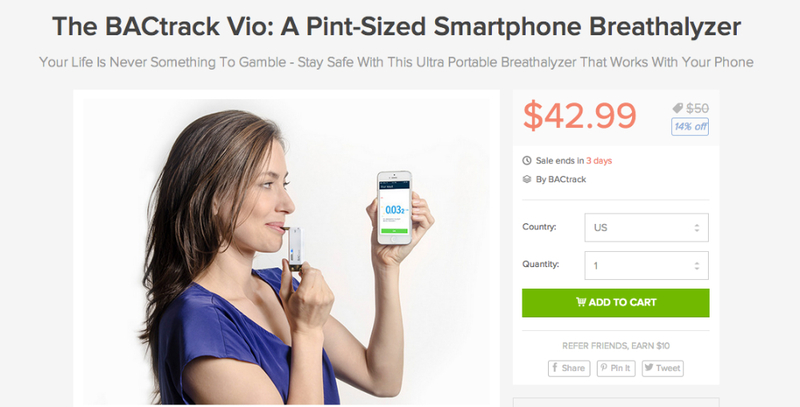 If you feel it necessary, given all of the potential drinks, the BACtrack Breathalyzer is currently available through the DL Deals store at a discounted price of just $42.99. What makes this breathalyzer cool is that it pairs directly with your Android or iOS device, displaying your blood alcohol content (BAC) 5 seconds after you blow into it. This is done with Bluetooth magic. As for its range, the breathalyzer can handle any BAC from 0.000% to 0.400%. That should even be able to handle your uncle who seems to black out every Thanksgiving. Other features include ZeroLine Technology, which will determine how long it will take for your BAC to return to 0.000%. This could help if you are stuck at the local bar and don’t want to risk getting pulled over with anything other than a zero. To top it off, the machine comes with 3 different mouth pieces, so you and the whole family can pass it around and see who can score the highest without puking. God, I love the holidays.